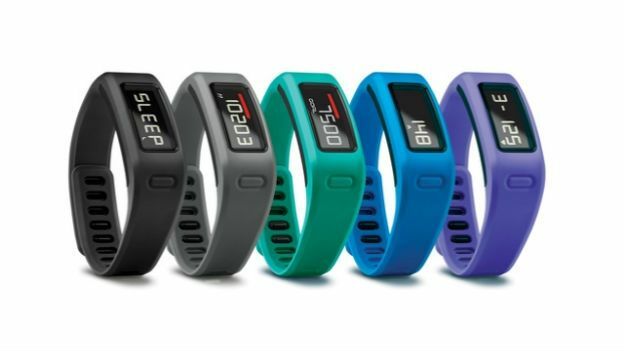 Garmin has announced it will be entering the wearable fitness market with a new tracker that it hopes will compete with the likes of the Nike+ Fuelband SE and the Fitbit Force. The GPS company revelaed a new fitness band at CES called Vivofit that logs your steps and activity level, displaying them on a small screen for your edification. Like any number of other fitness trackers you're able to set a goal, such as 10,000 steps, to achieve over the course of your day. However, the company has thrown in a couple of interesting additional features such as the ability to automatically assign you a daily goal based on its own measurements of how fit you are. It will then update the goal as you start hitting it. Similarly, if you've been inactive for a significant period of time a red bar will start to build up as you stay stationairy. The only way to diminish it is to get up and move around. There are the usual social features added in as well. You can join the Garmin Connect online community and find out what others are doing. There's also the option to enter competitions with other users. Garmin will be joining a host of other fitness trackers already battling for control of your wrists, including the likes of the Jawbone UP and the recently revealed LG Lifeband Touch. The company hasn't revealed UK pricing for the Vivofit, but it will hit the US market at $129.99 later this quarter. If you're thinking of getting a fitness band this year, then check out our feature on the best fitness tracker: top band to buy in 2014.